Former Cuban dictator attacks Israel in article entitled 'Palestinian Holocaust in Gaza'. Former Cuban leader Fidel Castro compared Israel's military operation in Gaza on Tuesday to a "disgusting form of fascism" that its ally, the United States, is unable to control. "I think that a new and disgusting form of fascism is emerging with considerable force at this moment in human history," Castro wrote in a column in the newspaper Granma titled "Palestinian Holocaust in Gaza." Castro's article appeared as a 72-hour truce took hold in the Gaza Strip, with Israel withdrawing troops after a month of fighting with Hamas and other Gazan terrorist groups. "Why does the government of this country (Israel) think that the world will be impervious to this macabre genocide that is being committed today against the Palestinian people?" he asked. "Maybe it hopes that the complicity of the North American (US) empire will be ignored in this shameless massacre?" the 87-year-old former president said. 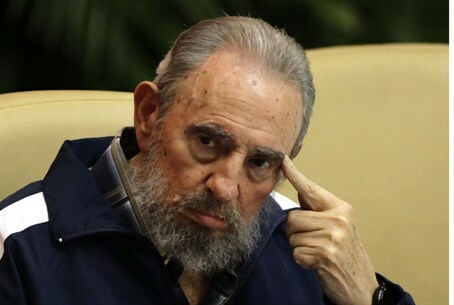 "There are facts that reflect the near total inability of the United States to face the current world problems," said Castro, who handed over power to his brother Raul in 2006 for health reasons. Communist Cuba broke diplomatic relations with Israel in 1973 after the Yom Kippur War. Arutz Sheva Staff contributed towards this article.